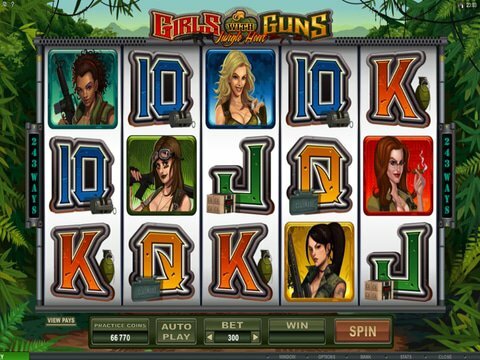 There aren't many no download slots available to Canadian gamblers that make strong females the stars, but the Girls with Guns - Jungle Heat slot machine from Microgaming certainly does. In it, you'll see some pretty hot women out in the jungle wielding some mean arms. Review it right here on this page with the Girls with Guns - Jungle Heat free play slot demo that is available to you with no download and no registration. As long as you have an internet connection, you can even do it on your mobile device. There are five reels and 243 ways to win here, and you can choose to spend anything from $0.30 to $30 per spin. The jackpot is worth up to $3000, so be sure that you make the right choice in terms of your coin options. The Rose Wilds will take the place of regular icons and can be stacked on any of the reels, providing some excellent opportunities. The Silhouette is also wild, but only appears on the middle reel and expands to fill all positions whenever it does. During the free spins round, 15 of which are triggered with three or more Heart Grenades, you'll get yet another wild - and it's a whole reel! There's definitely a lot going on, even without the second-screen bonus round or multiplier. If you enjoyed this title but you're in the mood for something a little more modern for real money play, then you'll enjoy Tomb Raider 2, also from Microgaming. This one boasts the infamous Lara Croft and boasts a jackpot worth up to 7500 coins that is quite a bit in cash if you choose a larger coin denomination. Features include free spins, Super Mode that is randomly triggered and provides some excellent payouts, and even the Global Adventure for those who like to travel!